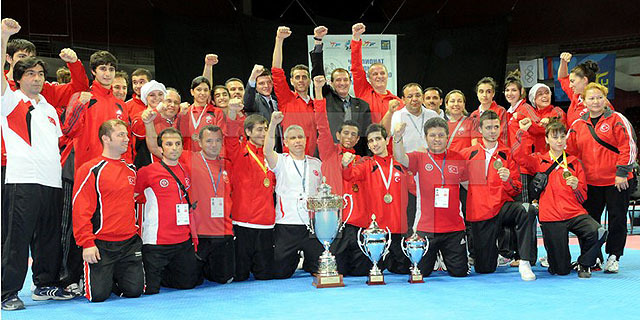 Turkish team became the leader, having grabbed the largest number of medals: 3 gold, 2 silver and 1 bronze medals are under their belt. St. Petersburg featured the final day of 2010 WTF European Taekwondo Championships. Gold medals went to Anastasia Barishnikova (Russia, under 73kg), Rosana Simon Alamo (Spain, over 73kg), Carlo Molfetta (Italy, under 87kg) and Tavakgul Bayramov (Azerbaijan, over 87kg). For Anastasia Barishnikova from Russia her semi-final fight against Nusa Rajher from Slovenia became the most difficult one. Russian athlete gained a close win with 8-7 score, while in the finals fighting against Sandra Rodelas Lorenzo (Spain) Barishnikova gained a landslide 17-3 victory. «I have met this athlete more than once: I knew her weaknesses (for example, the fact that she always uses the right stand) and have tried to use them. It worked out very well”, Anastasia Barishnikova told us after the fight. The victory of Spanish Rosana Alamo Simon in the over 73kg weight division appeared extremely convincing – she gave no chances to her competitors and did not let anybody doubt about her leadership. Alamo showed her emotions only after the final fight against Caroline Graffe from France, delivering a long gleeful speech in her native language into TV cameras. Seniors Male under 87 kg division featured the main sensation in the quarterfinal when Ivan Nikitin from Russia managed to beat world champion Tanrikul Bahri from Turkey in the sudden death round. However, Ivan failed to develop this success and was edged out in the semi-final fight by Augustin Bata (in the sudden death round again), having gained only a bronze medal. As a result, the champion title in this weight category went to Italian Carlo Molfetta who went through the whole tournament smoothly and beat Bata in the final fight with 6-1 score. Tavakgul Bayramov’s becoming a super heavyweight champion of Europe caused an extremity of joy of Azerbaijan team on tribunes of Yubileyny Sport Complex. Tavakgul Bayramov beat Zakaria Asidah from Denmark 13-5, thus making Azerbaijan the 10th country which won gold at 2010 WTF European Taekwondo Championships. The leaders of 2010 European Championships were awarded with 15 cups. The medal tally by nation is as follows: 1. Turkey. 2. France. 3. Spain. 4. Russia. 5. Great Britain. The best male teams are: Turkey, Russia, Germany, Azerbaijan and Spain. The best female teams are: France, Spain, Turkey, Russia and Great Britain.